This 9mm has a 3.5in barrel for an overall length of 6.5in. It has a high-impact polymer frame with high-impact grips and a black powder coat finish. The durable, attractive easy-grip finish assures a firm, comfortable grip and exceptional recoil control. It has an 8+1 capacity and a quick on/off thumb safety, magazine disconnect safety and last round lock open feature. It has 3-dot sights with a fully-adjustable rear and an additional rear peep sight. Hi-Point produces affordable, American-made firearms featuring 100% American parts and assembly. 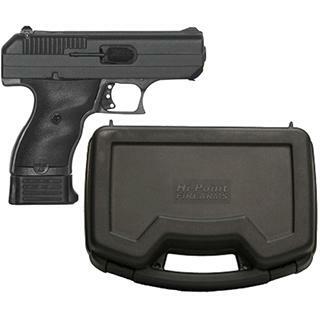 Hi-Point handguns are +P rated and accept all factory ammunition. Each comes with a free trigger lock. This 9mm come with a hard case.
" For the budget minded shooter, this is a great gun. The only drawback would be stripping the gun for cleaning. Somewhat difficult but doable. Heavy but very accurate and it comes with a factory lifetime warranty. Cant go wrong with this shooter. "